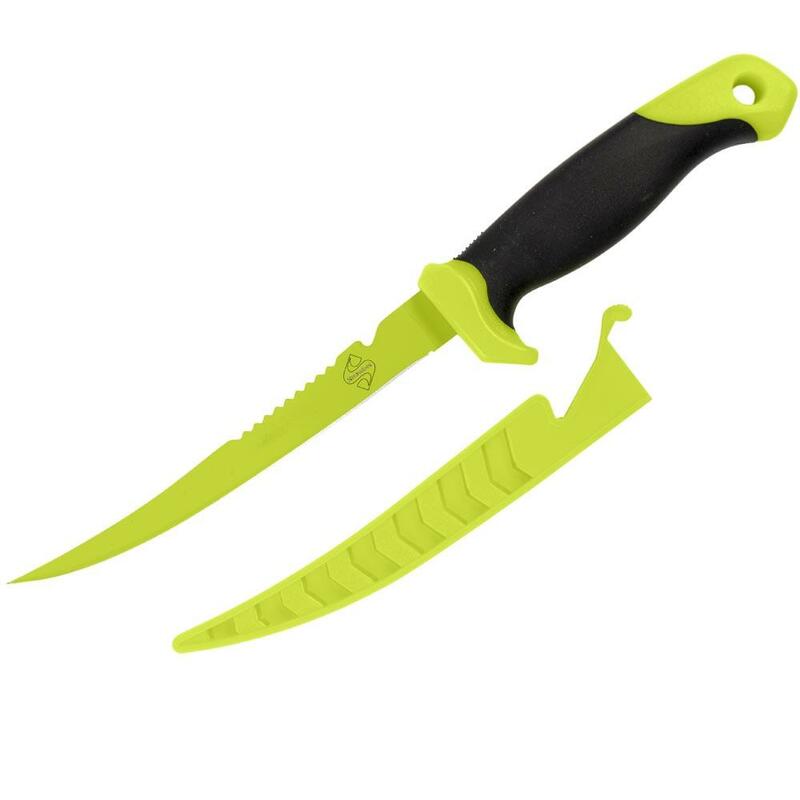 Snowbee 7" Filleting Knife, a quality 4116 grade German stainless steel blade, treated with hard, Chartreuse surface coating. On the back of the blade you will find a fish scaler, plus a safety blade. The Snowbee 7" Filleting Knife comes with a plastic sheath of which has a knife handle lock for safety and an ingenious cut-out, allowing you to cut braid or mono, using the rear ‘safety blade’ without removing the sheath. Another great and safe feature is the knife's rugged PP plastic handle with TPR Rubber section for extra grip, even when wet. Finally found a filleting knife that keeps to its promise. Would buy from you over and over again. Thanx for saving me money and having the best knife ever. Very flexible knife ideal for filleting. Good buy. Very good service and looks like a good product thanks Have not tried it yet so can't rate this product. Very pleased with knife and price. Service from troutcatchers excellent. Fantastic piece of kit,blade flexibility perfect. Ordered a second one immediately. Quantity item as you would expect from Snowbee with a super fast service from TroutCatchers, I will be shopping here again. Great knife I am a filleter for trade it's a med flex fantastic for flat red mullet etc find it stays sharper for longer than stainless filleting knives as long as you stay on top of it with your steel ain't disappointed great buy for the price. Great knife, very nice to work with. Many thanks.